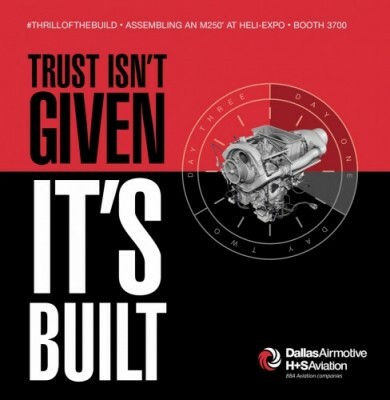 Stop by booth 3700 to witness our Heli-Expo Thrill of the Build, featuring an M250 engine! Join us at the Orlando Convention Center from March 2-5, at booth 3700. Learn more about our new Rotorcraft Centers of Excellence and our vision to become the world’s leading, independent, rotorcraft engine service company and your trusted engine provider. Your first choice for all your turbine engine needs… anywhere… anytime. We will also be presenting another Thrill of the Build event, which was debuted at NBAA 2014 in this same convention center. For Heli-Expo 2015, our Thrill of the Build will feature a Rolls-Royce M250 that powers more than 170 rotor and fixed wing applications across the globe. Our engineers will rebuild one over the three days of the show, taking time to showcase their skills and interact with show attendees. Also, Earthrounder and Aviatrix Amelia Rose Earhart will be at our booth emceeing the Thrill of the Build event and available to visit and take photos with visitors to the show. Make sure to visit us at Heli-Expo booth 3700! If you missed the Thrill of the Build at NBAA 2014, take a look at the video below.